A place to talk about NF, have fun and share. Help Raise Awareness of NF with a “Just Ask” T-shirt! It’s time for Doodle Day USA benefitting neurofibromatosis! Reggie Bibbs is a highly inspirational man living in Houston, Texas. He was born with neurofibromatosis (NF), a genetic disease which causes him to develop tumors on his body. NF can be a subtle disease, but in Reggie’s case it has left him with a disfigured face. After years of public frustration, he launched a unique one-man campaign to call attention to this disease. The t-shirt features on the front an abstract outline of Reggie’s face and, on the back, large type that simply says,’JUST ASK!’. Also included on the back is the url for Reggie’s website, www.reggiebibbs.com. Today, Reggie is also on MySpace and Facebook and has an online store on his website. He’s been interviewed by Wikinews too. Earlier this year, STANANDLOU and Reggie won 2 Gold ADDY Awards, one silver ADDY, and a Special Judges Award for Public Service Adversiting for their new “Just Ask” ads! 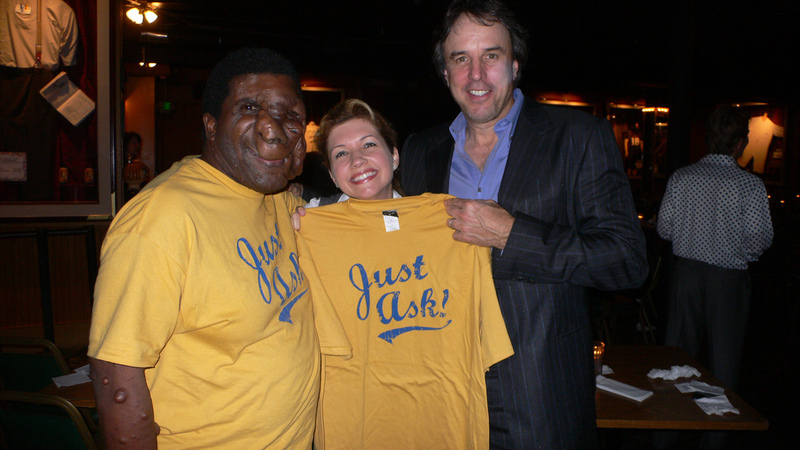 On April 14, 2009, the Just Ask Foundation became exempt from Federal income tax under section 501(c)(3) of the Internal Revenue code. To learn more about NF and Reggie, visit Reggie’s award-winning website and join him and his friends at the Neurofibromatosis Cafe. Thank you Lou. Not much of a drawer, but I hope it will help raise money for doodle day. Shelley, I’d like to know how you can be spreading joy and sunshine at the same time you’re harassing me? Now, if you were harassing Reggie, which, by the way, I strongly endorse, that would indeed be spreading joy and sunshine! when do i get my just ask tank top? I think we need to forget about harassing and think more on how we can get that tank top Shana has been JUST ASKing for. thanks reggie, it’s about time i got some luv on here. i will wear it everyday in may since it is awareness month. the smell alone will get everyone asking. Shana, I will make you your very own Just Ask tank top. Of course, it may be a little more open to the public than you’re used to but it will be a custom job just for you and I’ll even autograph it for you! Lou do you make all of your own tank tops, you know the ones you wear on the weekends? This is as close as I get to wearing a tank top. Congratualtion Reggie, you draw very well. I hope the The doodle day will bring you lot of money. You receive lot of comments in your site. Do you know all the people who write? # 12 Thanks Lou I’m sure we all needed to see that. # 13 Thanks Fraancis, I will read your text. Shana, Kevin Nealon is going to doodle for NF. He also told me to let him know the next time I’m in Los Angeles so we can meet again. Pretty cool wouldn’t you say? Can’t wait to see what he is going to draw. I have checked out the other doodles yesterday. Let me know when his is up! Shana, think of all the fun that could be had, if you was to go to California with me. If would be so stories to tell here. Only the ones we can talk about. I will let you know when Kevin’s doodle is posted. i am bored at home with the kids. any suggestions on what i can do before i go CRAZY? there is only so many rounds of ring around the rosy i go through before it does not make me giggle anymore. no need to fear Reggie is here! Hi Shelley, I was in the chat area last night. I have to be there more often now. Someone may want to chat. jerry will definitely be here on may 4th. Shana, That is good. I leave for Grand Rapids MI on May 7th. Maybe all of us can get together before then. looks like you are going to have to change your trip around reggie. we can do it the following weekend. . .
what are you doing in grand rapids? There is a group in Grand Rapids that has a race for nf. There will be a group meeting and the want me to talk about JUST ASK, and everything we are doing to bring awareness to nf. The first few days you have something planed? I leave on the 7th in the late evening. he will be here for a while i think so we will just stay in touch. . .
That’s cool. I really would like for all of us to visit. I think Jerry would be proud how all of us connected and now are friends. Good Morning to all. Has anyone else been to the doodle website for nf? The are adding new ones everyday. I’m watching For Kevin Nealon’s doodle. Havent seen Kevin’s yet. I guess it will take awhile. Maybe in the next few days we will see it. I just wanted to be the 38th commentor. THE SHIRTS SAY YOU CARE!!! If you’d like to order your very own, “official” JUST ASK! t-shirt, just CLICK HERE!! T-shirts are available in adult small, medium, large, X-large, 2X-large and 3X-large. Cost is just $15 per shirt with all proceeds going toward increasing awareness of neurofibromatosis. MY FAVORITE PEOPLE IN THE WORLD!